Early in 2018, EFG has kicked-off the first season of its International Mentoring Programme which brings together early-career geoscientists with experienced professionals who support them in better defining and pursuing their career goals. Since the programme’s scope is international, most meetings between mentees and mentors take place virtually using different telecommunication methods. 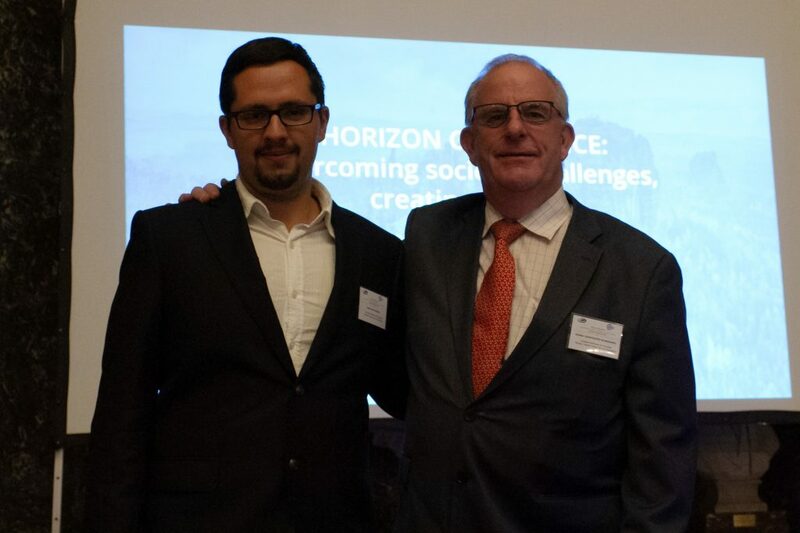 EFG’s Geoscience for Society Challenge has offered one of this year’s mentoring teams to meet face-to-face in Brussels, at the occasion of the Horizon Geoscience Dinner Debate which was held on 26 September 2018 and brought together EU policymakers and geoscientists to discuss how the geosciences can support policymaking more efficiently, especially in the light of the forthcoming Horizon Europe framework programme for research and innovation. For Antonio Polo and Christian Schaffalitzky, the winners of the Challenge, this was indeed the first time they could meet face-to-face and they appreciated this occasion offered by EFG to deepen their cooperation and network, at the same time, with other European geoscientists. The idea behind this initiative was to invite both mentees and mentors to reflect on how to promote the importance of geoscience towards society. The participants have submitted many innovative ideas, ranging from the organisation of an annual geology day with public outreach activities, to the representation of an area’s geology through cakes or other food, and an advertisement campaign on public screens which highlights the importance of geoscience to society. The mentoring programme’s steering group was pleased about the diversity and the creativity of the proposals made and the selection of the winners turned out to be tough.